Why Do My Baked Biscuits Have Cracks in the Top? Homemade biscuits, properly made, are feather-light and filled with tender layers. They have a golden-brown top with tiny cracks and crevices. For most bakers, the challenge in making biscuits is that they often turn out hard and flat. If your biscuits have a light, tender texture, the cracks on the top are probably nothing to worry about. Fat in the dough forms pockets of air that fill with steam, causing the biscuits to rise. As the biscuits rise, the tops crack slightly, which is the effect you want. If your biscuits have cracks in them, but they're also dense and hard, you've got a problem. Altering the temperature, mixing method or ingredients usually resolves the issue. The first rule in biscuit making is to keep the ingredients cold and the oven hot. The fat, especially, should be cold so it doesn't mix completely with the flour. 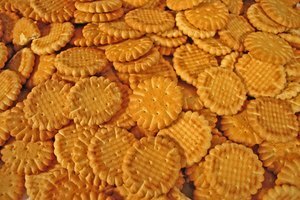 The chunks of unblended fat create the air pockets that give biscuits the desired loft. 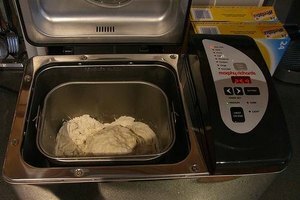 You can even go so far as to chill the flour and mixing bowl, although chilling the fat is probably sufficient. Once you've made the biscuits, place them on a baking sheet and chill them for 30 minutes in the freezer, which also helps the biscuits rise. Preheat the oven to 425 degrees Fahrenheit for at least 20 minutes. Baking biscuits at high heat ensures that they heat quickly so they rise before the tops bake and harden. Another common mistake when making biscuits is to mix them too vigorously. When you're making yeast breads, you encourage gluten formation by vigorous kneading. The opposite is true when making biscuits and other quick breads. Use a light hand to prevent gluten formation, which creates a tender crumb. Mix the ingredients with a fork, pastry knife or your hands, just until they hold together. If you use a food processor or stand mixer, use short bursts to avoid overdoing it. 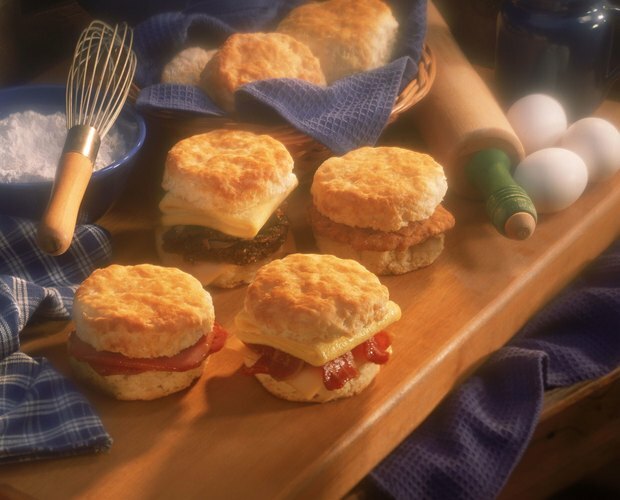 Some cooks prefer lard, while others prefer shortening, butter or even heavy cream for the fat in biscuits. All these types of fat can produce tender, flavorful biscuits, although the taste and texture varies slightly. Lard and shortening produce a very tender biscuit with a moist crumb. Butter and cream produce crispier biscuits with a delicious butter flavor and a sturdy crumb. Perhaps more important than the type of fat you use is the type of flour. Southern bakers often use low-gluten flour made from soft red wheat, which is hard to find in the northern and western parts of the U.S.; it makes a difference in the tenderness of your biscuits. Although all-purpose flour will do, use cake flour if you have it or add a spoonful or two of cornstarch to your flour. Just as you babied the dough when you were mixing it, you should take the same care when you roll it out and cut it. Pat the dough into a 1/2-inch-thick square or round with your hands, or roll it out carefully. Dust your countertop with just a little flour, because too much flour can harden the biscuits. Use a round biscuit cutter and make sure you press straight down without twisting. Another option is to cut the dough into wedges or squares with a pizza cutter or sharp knife. Why Do My Flapjacks Crumble?